The legendary Chinese hot pot was invented in Chongqing. Originally developed as a warming tool against the freezing Chongqing winters, steaming hot pots are now enjoyed all over the world but visitors to Chongqing may get a kick out of delving into a hot pot right here at the original source. 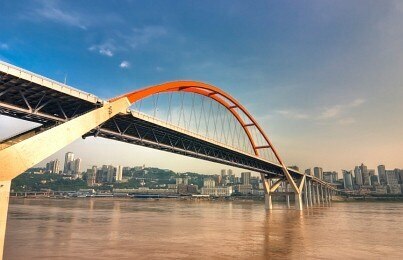 Chongqing is an easy city to visit. The main parts of downtown offer multi-lingual signage and the travel options are reliable and cheap. The city is modern and visitor-friendly despite being a center of history and containing large residential areas that have changed little for centuries. English is not widely spoken, but locating an English-speaker if necessary shouldn't be difficult. Chongqing represents new China at least as much as its more famous urban rivals like Shanghai and Beijing. Business meetings take place in skyscraper boardrooms, while dumpling shacks in back alleys dish out tasty snacks as they have done for centuries. Chongqing is alive with activity but it is fairly low on the scale when it comes to nightlife and bar-hopping. Locals are shopping mad and will break up retail frenzies with stops at cinema multiplexes or outdoor performances of dance, music and theater. The massive retail plaza of Jiefangbei is home to all the major Chinese department stores such as New Century and Commercial Mansion as well as over 6,000 other retailers so this part of town should be more than adequate for even the most die-hard shopper.